with our multiple CD-R copiers. A&M Recording Studios' post-production facility includes one of the most impressive duplication capabilities we've ever come across. 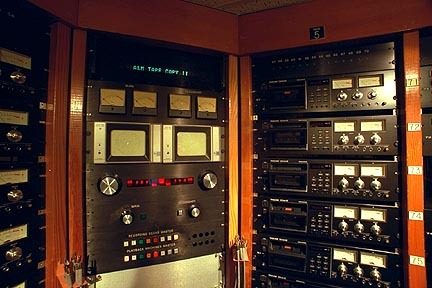 Housed upstairs in the recording studios situated on the old Charlie Chaplin movie lot in Hollywood is a large room with an entire wall of racks housing TASCAM 122MKIII professional cassette decks. A&M has a current total of 75 machines which are connected to a central computer controller, running custom software and hardware created by designer and record producer Stephen Barncard. The software provides eight program pages, each divided into a main and secondary systems. There are two monitoring systems and each of the 75 decks can be auditioned individually by means of a scanner feature in the software that allows every decks playback head to be listened to for quality control. The scanners scan rate is adjustable, so a fraction of a second or any time desired can be heard on each deck in sequence. 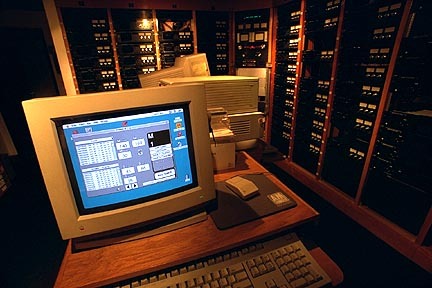 The hardware has a total quantity of 156 inputs on two stereo busses to allow the monitoring of every audio device in the room, all controlled from a Macintosh computer. The other Macintosh in the room is used to create custom lables for cassettes, DATs and CDs. In addition, A&M Post Production can create many copies of not only your Red Book audio CD, but any other known CD format as well. And we can make CD-Rs from your DATs. Call today for competitive pricing on all your media copying needs.